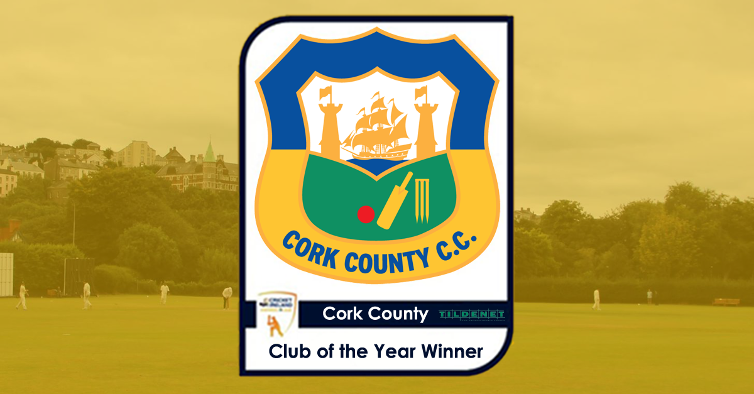 Cork County received the prestigious Tildenet Club of the Year Award after a superb 2016 season for the Munster club during which in addition to winning the Leinster Division Two title, they also retained the Munster Premier Division title. The Leinster Division 2 triumph included nine straight wins which saw the Leesiders overcome hot favourites Leinster CC and clinch automatic promotion back to Division 1. Success in the Munster Premier Division saw County remain unbeaten in the competition and safely retain their league crown. Their T20 outfit, the Cork County Rebels, also retained their Senior T20 League title. This award is just recognition for the great achievements the side from the Mardyke have accomplished considering it was their second Leinster league title in four seasons following their Division 3 triumph in 2013. Other awards handed out on the night saw Ireland stars Ed Joyce and Ciara Metcalfe have been rewarded for impressive international seasons by being named winners of the top prizes at the 2016 KPC Group Cricket Ireland Awards. Joyce fought off tough competition from Kevin O’Brien and Tim Murtagh to claim the KPC Group International Men’s Player of the Year award. He scored 522 runs during the qualification period at an average of 58, scoring two centuries against Afghanistan. It’s a hat-trick for Joyce, who previously won the award in 2013 and 2015. Ciara Metcalfe scooped the Cricketshop.ie International Women’s Player of the Year award, beating off the challenge of Isobel Joyce and Kim Garth. The Hills’ leg-spinner Metcalfe was rewarded after an excellent season saw her take 22 wickets at just 15.59, helping Ireland to wins over both South Africa and Bangladesh. She also took 4 for 15 against Sri Lanka in the T20 World Cup. Barry McCarthy is this year’s Sunday Independent Aengus Fanning Emerging Player of the Year. The 24 year-old enjoyed a remarkable debut season in international cricket, taking 18 ODI wickets in just eight matches, including four-wicket hauls against Pakistan and Afghanistan. Former Ireland wicket-keeper Paul Jackson became the 13th inductee to the Cricket Ireland Hall of Fame, which is voted for by the Cricket Writers of Ireland. Jackson joins fellow Irish cricketing legends Simon Corlett, Mike Halliday, Stephen Warke, Ivan Anderson, Gerry Duffy, Ginger O’Brien, Ossie Colhoun, Roy Torrens, Dougie Goodwin, Jack Short, Alf Masood and Alec O’Riordan. Cricketshop.ie International Women’s Player of the Year – Ciara Metcalfe. Notts Sports Coach of the Year – Rob O’Connor. Full details of the 2016 Cricket Ireland can be viewed by clicking here.